Red Dawn is a 2012 American war film directed by Dan Bradley. The screenplay by Carl Ellsworth and Jeremy Passmorea is a remake of the 1984 film of the same name. The film stars Chris Hemsworth, Josh Peck, Josh Hutcherson, Adrianne Palicki, Isabel Lucas, and Jeffrey Dean Morgan. The film centers on a group of young people who defend their hometown from a North Korean invasion. Metro-Goldwyn-Mayer announced its intention to remake Red Dawn in May 2008 and subsequently hired Bradley and Ellsworth. The principal characters were cast the following year and the film went into production in September 2009 in Mount Clemens, Michigan. Originally scheduled to be released on November 24, 2010, the film was shelved because of MGM's financial troubles. While in post-production, the invading army and antagonists were changed from Chinese to North Korean in order to maintain access to the Chinese box office, though the film was still not released in China. FilmDistrict bought the worldwide distribution rights in September 2011 and the film was released in the United States on November 23, 2012. An introductory montage shows the fallout of an economic crisis in the European Union and a weakened NATO alliance, amid increasing cooperation between an increasingly militant North Korea and ultranationalist-controlled Russia. The increased deployment of U.S. troops abroad leaves the mainland vulnerable. U.S. Marine Jed Eckert is home on leave in Spokane, Washington. He reunites with his father, Spokane Police Sergeant Tom Eckert and his brother, football player Matt Eckert. The morning after a mysterious power outage, Jed and Matt are shocked to see swarms of invading North Korean paratroopers and transport aircraft. Their father tells them to flee to their cabin in the woods while he helps the townspeople. They are later joined there by Robert Kitner, Daryl Jenkins, and Pete. Tensions build as the teens try to decide whether to surrender to the invaders or resist, with Pete ending up betraying their position. North Korean soldiers, under the command of Captain Cho, bring Sergeant Eckert and the mayor out to convince the group to surrender; while the mayor persuades the boys to give up, Cho executes Sergeant Eckert after he refuses to cooperate and actively encourages them to resist. Later, Jed announces that he intends to fight and the others agree to join him, calling themselves the Wolverines after their school mascot. After acquiring weapons, establishing a base in an abandoned mine, and being trained by Jed, the Wolverines begin a series of guerrilla attacks against soldiers and collaborators, including Pete. The North Koreans retaliate by bombarding the surrounding woods to destroy the Wolverines' base, killing Danny and Julie, with the remaining survivors fleeing deeper into the woods. The Wolverines eventually encounter Marine Sergeant Major Andrew Tanner and two other Marines, Smith and Hodges. They reveal that the Russian-backed North Korean invasion used an EMP weapon that crippled the U.S. electrical grid and military, followed by landings along the east and west coasts, with American counterattacks eventually halting their advances, leaving an area stretching from Michigan to Montana and Alabama to Arizona as "Free America". They also reveal that Captain Cho carries a suitcase containing an EMP-resistant radio telephone that would enable the U.S. command to contact its remaining forces for a counter-offensive. The Wolverines assist Tanner, Smith, and Hodges in infiltrating the local police station, the North Koreans' center of operations. They succeed in stealing the suitcase with Jed avenging his father's death by killing Cho, though Hodges is killed in the firefight. After they successfully escape with the suitcase, the Wolverines regroup at their base. After a short conversation between Matt and Jed, however, they are ambushed by Russian Spetsnaz and Jed is killed in the firefight. Visibly shaken, Matt and the rest of the Wolverines escape with the suitcase to the Marines' extraction point. The next day, Robert comes to the realization that during an earlier escape, Daryl had been tagged with a tracking transmitter and that the Russians have been homing in on them ever since. After some thought, Daryl accepts the fact that he cannot go on with them and decides to stay behind, his fate unknown. Sergeant Major Tanner and Smith depart in a UH-1 with the suitcase. The remaining Wolverines decided to stay behind and continue to fight, recruiting more members and raiding prisoner camps, with Matt now leading the effort to continue opposing the occupation. In May 2008, at the Festival de Cannes, Harry Sloan and Mary Parent from MGM announced that a remake of Red Dawn was in the early stages of pre-production, with the remake due to be directed by Dan Bradley, who had previously worked as a second unit director and stunt coordinator on films such as The Bourne Ultimatum, Spider-Man 3, Independence Day, and Quantum of Solace. MGM subsequently announced that Red Dawn would be remade "keeping in mind the post-9/11 world that we're in". Later the same month, MGM announced that Dan Bradley had been confirmed as the director with Carl Ellsworth, screenwriter of Red Eye and Disturbia, writing the updated screenplay. Ellsworth worked from a story written by Jeremy Passmore. Vincent Newman (A Man Apart) was announced as the producer. Australian Chris Hemsworth was cast in a lead role: other cast members include Josh Peck, Adrianne Palicki, Josh Hutcherson, Isabel Lucas, Edwin Hodge, and Connor Cruise. Principal photography began September 2009 in Mount Clemens, Michigan. The closed Notre Dame High School in Harper Woods, Michigan (Greater Detroit) was used as a filming location. Mark Binelli, author of Detroit City is the Place to Be, wrote that the school cafeteria was used as the catering hall for the employees. According to photographs taken on set, the film features propaganda pamphlets, posters, and banners featuring People's Liberation Army symbols, such as the August 1 star. The posters attempt to garner support for a Chinese occupation, with slogans such as "Rebuilding Your Reputation", "Repairing Your Economy", and "Fighting Corporate Corruption". In June 2010, release of the film was delayed by MGM’s financial difficulties. The delay came amid growing controversy in China after excerpts of the script were leaked on the website The Awl. The film drew sharp criticism from the Global Times, one of the leading Chinese state-run newspapers, with headlines such as "U.S. reshoots Cold War movie to demonize China" and "American movie plants hostile seeds against China". One of the articles stated: "China can still feel U.S. distrust and fear, especially among its people. Americans' suspicions about China are the best ground for the hawks to disseminate fear and doubt, which is the biggest concern with the movie, Red Dawn." In January 2011, the first cast photo was released along with news that MGM would release the film once their Chapter 11 restructuring is completed. Red Dawn was one of three already completed MGM projects scheduled to be released in 2011. In March 2011, the Los Angeles Times reported that MGM changed the villains in its Red Dawn remake from Chinese to North Korean in order to maintain access to China's lucrative box office. The changes reportedly cost less than $1 million and involve changing an opening sequence summarizing the story's fictional backdrop (dropping the original storyline of Chinese "repossession" after the US defaults on loans for a North Korean invasion), re-editing two scenes, and using digital technology to change Chinese symbols and dialogue to Korean. The film's producer Trip Vinson stated: "We were initially very reluctant to make any changes, but after careful consideration we constructed a way to make a scarier, smarter and more dangerous Red Dawn that we believe improves the movie." Ramin Djawadi composed the score to the film. All music by Ramin Djawadi. Dan Bradley, Adrianne Palicki, Josh Peck, Tripp Vinson and Fantastic Fest founder, Tim League at the world premiere of Red Dawn in Austin, Texas. In September 2011, it was reported that Metro-Goldwyn-Mayer was finalizing a deal with the independent studio FilmDistrict to distribute the film in the United States. In December 2011, FilmDistrict reached a deal to distribute its 2012 films including Red Dawn through Open Road Films. In September 2012, it was announced that the film would premiere on September 27, 2012 at the Alamo Drafthouse Cinema in Austin, Texas, closing out the Fantastic Fest film festival. 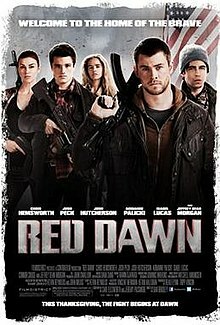 Red Dawn opened in theaters in the United States on November 21, 2012. The film earned $7.4 million in its first two days and finished in seventh place, earning $14.6 million in its first weekend. The film closed in theaters on February 21, 2013, grossing a total $50.9 million worldwide. Red Dawn was released on DVD and Blu-ray on March 5, 2013. On Review aggregator Rotten Tomatoes the film has a rating of 12% based on 131 reviews and an average score of 3.8/10. The site's critical consensus reads, "The rebooted Red Dawn lacks the original's topicality, but at least pays tribute in delivering the same short shrift to character development and general logic." On Metacritic the film has a score of 31 out of 100 based on 33 reviews, indicating "generally unfavorable reviews". The film earned a Razzie Award nomination for Worst Prequel, Remake, Rip-off or Sequel. Frank Scheck of The Hollywood Reporter said, "An already silly premise is given a ham-fisted treatment in this ill-advised remake of John Milius' 1984 hit action film". Manohla Dargis of The New York Times said, "Bradley... handles the low-fi action well, which helps divert attention from the bargain-bin special effects, bad acting and politics". Mark Olsen of the Los Angeles Times said, "Reasonably dopey fun on its own, the remade Red Dawn simply can't stand up to the real-world issues it steps on like a land mine". Roger Ebert of the Chicago Sun-Times said, "The story's time frame is confusingly murky. How long does it take the North Koreans to land... and start running things? What is their game plan? Is this a national invasion? We're unclear what's happening in the rest of the United States". Joe Leydon of Variety wrote, "[the] battle scenes are infused with a propulsive sense of urgency, as Bradley (a vet stunt coordinator and second unit director) often achieves an effective semi-documentary look". Binelli, Mark. Detroit City is the Place to Be. Metropolitan Books, Henry Holt and Company (New York). First Edition, 2012. ISBN 978-0-8050-9229-5 (hardback version). ^ a b "Red Dawn". American Film Institute. Retrieved November 13, 2016. ^ "Red Dawn Remake Finally Gets A Release Date". ScreenRant.com. November 24, 2011. Retrieved November 26, 2011. ^ "Red Dawn (12A]". British Board of Film Classification. March 8, 2013. Retrieved October 28, 2016. ^ a b c "Red Dawn (2012)". Box Office Mojo. Internet Movie Database. Retrieved April 3, 2013. ^ O’Connor, Sean; Armstrong, Nicholas (October 28, 2015). "DIRECTED BY HOLLYWOOD, EDITED BY CHINA: HOW CHINA'S CENSORSHIP AND INFLUENCE AFFECT FILMS WORLDWIDE" (PDF). The U.S.-China Economic and Security Review Commission. Retrieved July 20, 2017. ^ a b Fernandez, Jay A.; Borys Kit (July 9, 2008). "'Red Dawn' redo lands director, scribe; MGM will remake the 1984 action drama". The Hollywood Reporter. ^ Zeitchik, Steven (May 17, 2008). "MGM: Two up for a remake treatment — MGM may remake the '80s action films". The Hollywood Reporter. ^ Bartyzel, Monika (July 9, 2008). "'Red Dawn' Remake Finds Writer and Director". Cinematical. Archived from the original on July 22, 2012. Retrieved June 17, 2009. ^ "Ellsworth Penning Red Dawn Remake". ComingSoon.net. Retrieved June 17, 2009. ^ "Nikki Finke's Deadline Hollywood Daily » EXCLUSIVE: Chris Hemsworth Is 'Thor'". Deadlinehollywooddaily.com. Retrieved June 17, 2009. ^ Fernandez, Jay A. "Two cast in 'Red Dawn' remake". The Hollywood Reporter. Archived from the original on June 20, 2009. Retrieved June 17, 2009. ^ "Pics From The Set Of The RED DAWN Remake!!". Ain't It Cool News. September 15, 2009. Retrieved September 15, 2009. ^ "Hollywood remakes Cold War era blockbuster, "Chinese soldiers" wearing 07 camouflage "invade America" (好莱坞翻拍冷战时大片 "中国军人"穿07迷彩"入侵美国")" (in Chinese). Tiexue (Original report from XINHUA). Retrieved October 4, 2009. ^ Xiao, Dazhong (September 30, 2009). "Hollywood remake of Cold War epic film, with strong drama depicting a Chinese "invasion of the United States"" (in Chinese). Phoenix TV News. Retrieved October 10, 2009. ^ Russ Fischer (June 10, 2010). "More MGM Fallout: Red Dawn Delayed, Perhaps Indefinitely?". /Film. Archived from the original on September 18, 2012. Retrieved June 15, 2010. ^ Jonathan Landreth (June 1, 2010). "Chinese press rails against 'Red Dawn'". The Hollywood Reporter. Retrieved June 15, 2010. ^ Pietro Filipponi (January 3, 2011). "New Cast Photo & Release Info for RED DAWN Starring Chris Hemsworth & Jeffrey Dean Morgan". The Daily Blam!. Retrieved January 4, 2011. ^ Brodesser-Akner, Claude (January 11, 2011). "The Long-Delayed Red Dawn Remake Could Have Been Scarily Topical". Vulture. Retrieved January 5, 2013. ^ Fritz, Ben & Horn, John (March 16, 2011). "Reel China: Hollywood tries to stay on China's good side". Los Angeles Times. Retrieved March 16, 2011. ^ a b "Red Dawn by Ramin Djawadi". Retrieved November 3, 2016. ^ Fritz, Ben & Horn, John (September 26, 2011). "'Red Dawn' remake to come out next year from FilmDistrict". Los Angeles Times. Retrieved September 27, 2011. ^ Frankel, Daniel (December 6, 2011). "FilmDistrict has reached deals to distribute its 2012 titles through Open Road". Reuters. Retrieved December 14, 2011. ^ Clark, Noelene (September 2, 2012). "'Red Dawn': Controversial remake to debut at Fantastic Fest in Austin". Los Angeles Times. Retrieved September 5, 2012. ^ Subers, Ray (November 23, 2012). "'Twilight,' 'Skyfall' Devour Newcomers on Turkey Day". Box Office Mojo. IMDB. Retrieved November 26, 2012. ^ Subers, Ray (November 25, 2012). "Weekend Report: 'Twilight,' Bond Dominate Fruitful Thanksgiving". Box Office Mojo. IMDB. Retrieved November 26, 2012. ^ "Red Dawn Blu-ray and DVD". March 5, 2013. Archived from the original on November 3, 2013. ^ "Red Dawn (2012)". Rotten Tomatoes. Flixster. Retrieved November 20, 2012. ^ "Red Dawn 2012". Metacritic. Retrieved November 13, 2016. ^ "The 33rd Annual RAZZIE® Awards". Razzies.com. Archived from the original on February 27, 2013. Retrieved July 11, 2013. ^ Scheck, Frank (November 15, 2012). "Red Dawn: Film Review". The Hollywood Reporter. Retrieved November 19, 2012. ^ Dargis, Manohla (November 20, 2012). "He's Lost the Game. Can He Beat the Koreans?". The New York Times. Retrieved November 21, 2012. ^ Olsen, Mark (November 20, 2012). "Review: 'Red Dawn' remake won't win hearts and minds". Los Angeles Times. Retrieved November 21, 2012. ^ Ebert, Roger (November 20, 2012). "Red Dawn". Chicago Sun-Times. Retrieved November 21, 2012. ^ Leydon, Joe (September 27, 2012). "Red Dawn". Variety. Retrieved November 19, 2012. Wikimedia Commons has media related to Red Dawn (2012 film). This page was last edited on 4 March 2019, at 04:01 (UTC).